In this post, I explain why I decided to turn my Gen. Ed. Humanities classes into writing classes, with the goal of "teaching writers." As a natural consequence of those choices, the most important content in my classes is now the content that the students themselves create. That doesn't mean they do not read a lot of traditional Humanities content. The difference is what they do with that content: instead of taking a test to demonstrate their knowledge of the content, they re-use the content in their own writing. Here's how all that came together for me, starting back in 1999 when I first began teaching Humanities courses at the University of Oklahoma. General Education at OU. I teach two online General Education courses: Mythology and Folklore (MLLL-3043) and Epics of Ancient India (MLLL-4993). These upper-division Gen. Ed. courses are not designated as "writing courses." In fact, there is no "writing course" requirement after the Freshman Composition sequence at OU. Instead, these are content courses. Specifically, they are part of the Gen. Ed. Humanities requirement: the Myth-Folklore course is a Western Humanities course, while Indian Epics is Non-Western Humanities. Students need to cover some Western content (two courses) and some non-Western content (one course) in order to get their undergraduate degree from the University of Oklahoma. This applies to all undergraduate students: engineering majors, accounting majors, opera majors, everybody. Because the Gen. Ed. courses are required for graduation, they are in high demand, and because online courses fit everybody's schedule, the online Gen. Ed. courses fill up almost instantly. So, easy-peasy, right? Find a textbook, prepare some lectures (hey, Powerpoint! ), get the midterm and final exams ready, and you've designed your course. . .
. . . But wait: what's the point of that exactly? Humanities as Skills, not Content. Even though I am someone with a passion for literature, language, and the history of both, I am not someone who is a big believer in the teaching of Humanities content as an inherently valuable activity. Especially when you look at the hodge-podge way the OU General Education Humanities requirement is structured (no connection from course to course; instead, just two from Column A, one from Column B), I am not persuaded that students will get a lot of long-term re-use and retention of that content. The way you really retain something is by using and re-using what you have learned. So, let's be honest: except for random tidbits (watching a Hollywood movie loosely inspired by ancient mythology, meeting a coworker named Parvati or Arjun, etc. ), most of my students are not going to have any occasion to keep on using the content I might teach in my courses. That's why I would argue that teaching Humanities should not be about content, but rather about skills, a whole range of skills, preferably transferable skills, that are essential to the Humanities as a discipline. By focusing on skills rather than content, I feel like I can do a better job of making the required Gen. Ed. courses worth the time and tuition my students must spend on those courses. So, the next question: what skills to teach? My answer: writing skills. Student Writing. 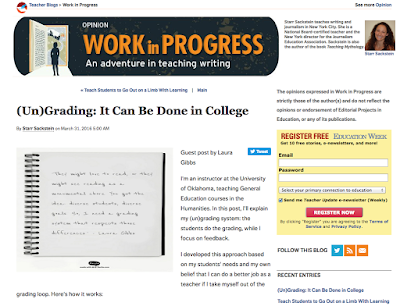 I was very naive when I started teaching at the University of Oklahoma, and I suspect I was not alone in my naivete: I assumed that all the students would be able to write college-level work, so that I could assign written papers without really having to worry about their writing per se. Instead, I discovered that my students had a mind-boggling range of writing skills, from excellent college-level writing skills to writing skills that were at a high-school or even junior-high-school level. So, my self-imposed task was clear: I needed to design Humanities courses with an emphasis on writing skills that would benefit all my students, both those with excellent writing skills and those who needed a lot of remedial help. As I pondered the question of how to teach classes of value for that whole range of students, I eventually realized: I need to teach writers, not writing. Teaching Writers, not Writing. This chart (which comes from the wonderful people at MovingWriters.org) explains very clearly just what it means to teach writers as opposed to just assigning writing or even teaching writing. When I first found this chart circulating on the Internet a year or two ago, it was kind of eerie: it had taken me years to figure this out on my own, with so many missteps along the way. If only someone had shared a chart like this with me back in 1999! Because, really, this chart says it all for me: by teaching writers, I can support every single student as they follow the way of the writer, wherever that may lead them and no matter where they begin that journey. 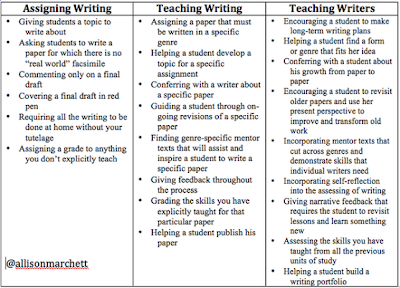 Every one of the principles there in the "teaching writers" column of the chart is important in my classes: long-term writing plans with forms and genres chosen by the students, a focus on growth from paper to paper (or, in my classes, from story to story) where students continuously transform previous work and also benefit from mentor texts (the work of other students, past and current), with lots of self-reflection by the students and lots of narrative feedback from me so that skills will build from week to week, culminating in a portfolio product at the end of the semester. And that brings me back to where I started this post: student writing as the most important class content. Student Writing as Class Content. So, when the goal is to teach writers, the work of those writers is naturally the most important class content. The culmination of each week is the students reading each other's writing, and the culmination of the semester is not an exam over the traditional reading but instead the body of work that the students have created. As students share their writing with others, they gain confidence as writers. Just as importantly, by looking at the writing of other students critically and analytically (more about that here), students get the benefit of those other students' ideas and skills, while also learning how to turn a critical and analytical eye on their own work. But hey, what about Mythology and Folklore? What about those Indian Epics? Don't worry: they are all still there! Traditional Content: Reading to Write. Yes, there is a "traditional" reading component in my classes, just as you would expect in a Humanities Gen. Ed. class. Each week culminates with a focus on the students' writing, but each week begins with the students reading the kind of content you would expect in a Myth-Folklore or an Indian Epics course; the difference is that the reading provides raw material to use in their own writing every week. They read stories and then re-create those stories in their own way, just as traditional storytellers reworked traditional stories in new ways for new audiences. So, in the Myth-Folklore class, the students read myths and legends from different cultures every week, choosing what they read from our "UnTextbook" of online stories; you can get a sense of how that works by reading the Introduction to the UnTextbook here: Welcome to the Myth-Folklore UnTextbook. In the Indian Epics class, I am switching to an UnTextbook model for Fall 2015, but even now the course is based on reading multiple versions of the epics by different authors; you can see how that works here: Indian Epics for Spring 2015. Update Fall 2015: Here is the Indian Epics UnTextbook. So, in the end . . . But does it all fit only because of the classes I teach, the person I am, and the school where I happen to work...? Or are there ideas here that can be generalized to different classes, to different teachers, to different students and schools...? Those are questions that you will have to answer for yourselves. Personally, I suspect that there are dynamics at work here — dynamics of learning and creativity, dynamics of identity and sharing — that mean these same ideas really can be of value in any classroom anywhere. But all I can say with 100% certainty is that it all fits together very nicely in my classes. That is not to say that I do not face challenges. Every day has its challenges! But I am very happy for the foundation on which I have built my classes. It is a deep foundation that has allowed me to reach high, so that with every new challenge I am able to find solutions that improve my classes from day to day, semester to semester, and year to year! So, what do you think? Do you teach writers in your courses? Should you...? Could you...? 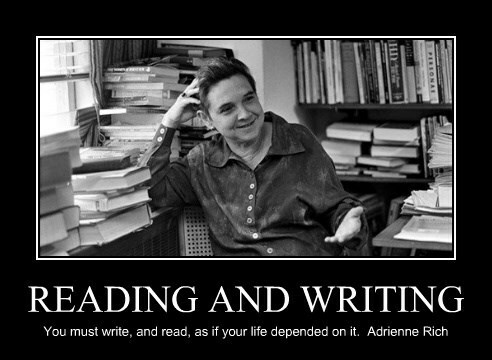 I'll close with some words of wisdom from Adrienne Rich: You must write, and read, as if your life depended on it. Great post, Laura! "Humanities as Skills, not Content" - LOVE IT. Teaching and learning at this level is not easy or fast - but it is enduring! Requires deep thought/effort by both teacher and learner. So impressed with what all you do and how you're constantly working to improve.